Can you believe we only have 2 1/2 weeks left for March?! Spring break will be here in no time. Ipsy's March bag theme is Destination Beauty. I feel like the products in my bag are welcoming spring or trying to hint that I need to go to the beach lol. Mainly because of the colors I received. 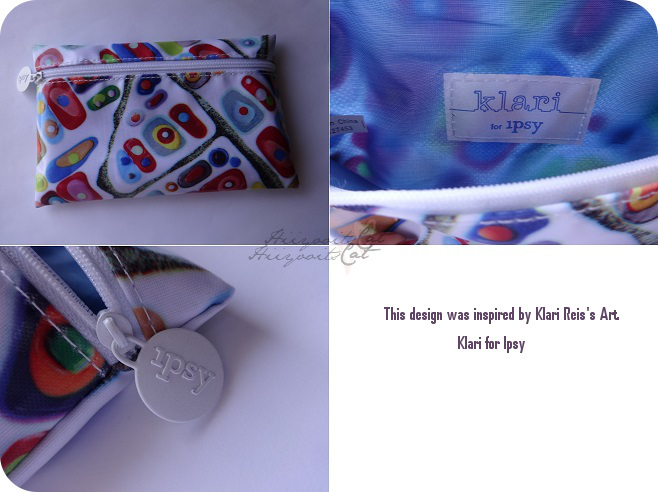 This month's bag was designed my Klari Reis and was inspired by her own art. You can view her designs if you google her name. You will most likely see the exact same design of this bag in your search. Personally, it isn't my cup of tea but there are many people that do like the pattern. One of the products I received was the Mini Flawless Beauty Primer. I'm not sure if it's sold in stores but I found it on their website for $9. I think it's a travel size version of the original size that values for $22. This product is a face primer meant to even skin tone as well as add a healthy youthful glow. It is quite hydrating and blends out smoothly. However, the second I finish blending and take a look at my fingers all of the shimmer from the primer is on them. The shimmer also settled on the dry spots on my skin. The shimmer in the primer is what adds the glow to your skin. This primer gives you a dewy look, so people with oily skin may not like it. Also if you have really dry skin be sure to exfoliate properly and moisturize well before application. I also received a Moxie lipstick sample in 'get ready' by bare minerals; the full size retails for $18. It's one of those MLBB (my lips but better) lipsticks. 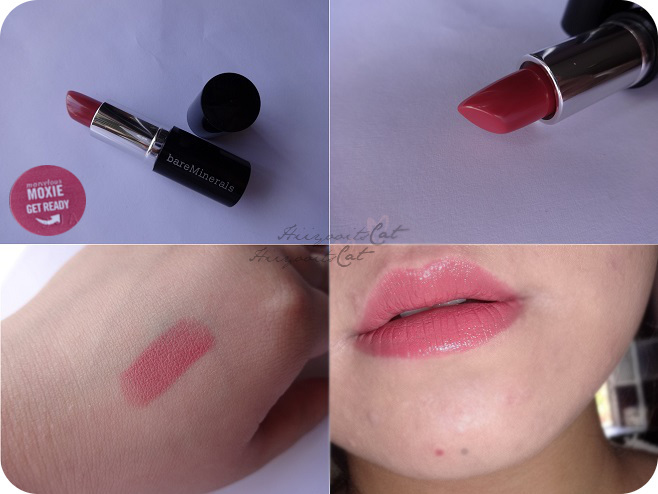 A very versatile pink lipstick that everyone can wear. It glides on very smoothly and is quite hydrating as well. The wear time is normal like any other lipstick, wears off after eating and drinking. In my bag was also an eyeshadow quad that retails for $16 by Be A Bombshell. 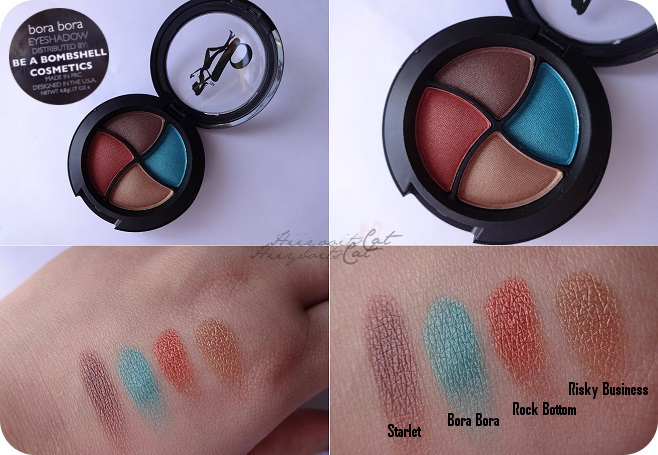 When I saw this quad I instantly thought of tropical and look at the name.. it's Bora Bora. The colors are pretty and go well together. They all have frost/satin finishes and are quite pigmented when swatched and applied with my finger. The only thing I do not like about BAB packaging is that you have to put a little oomph into opening it. You can view all the colors here >> Nicole by OPI (Roughles) - On What Grounds? I received a Nicole by OPI nail polish in my bag as well! I do enjoy receiving nail polishes however the texture of this one isn't my cup of tea. The color however is beautiful. It reminds me of China Glaze's For Audrey. 'On What Grounds?' is from the Roughles line and it basically a textured polish. When completely dried it feels like sand paper and looks very 'rough'. Since that is the finish they are going for you do not need a topcoat. I went ahead and added a top coat because I was curious. With the topcoat you can still feel the texture but it's just not as rough. It looks like a regular texture polish with a top coat. 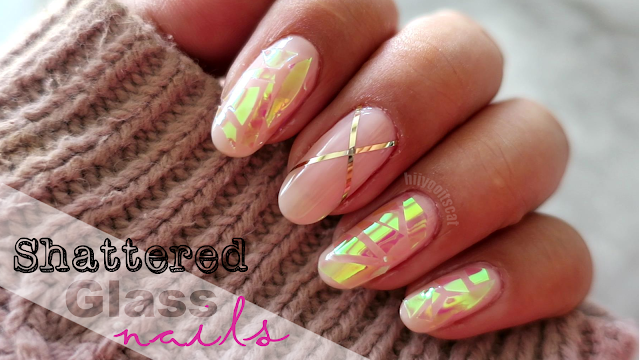 Depending on where you shop the retail value of the polish can range from $6-$8. My bag this month is worth a little over $30! The same as last month and I do like it. I always enjoy getting all make-up products in my bag. Even though I am not too thrilled on the bag design I am happy with the contents. I usually just give my bag away to my mom anyway or save them to store gifts in, so they come in handy. My least favorite product this month would be the nail polish and my favorite is the lipstick.